The Ritz is a unique quartet in that it is comprised of four vocal music teachers, each from a different school district. 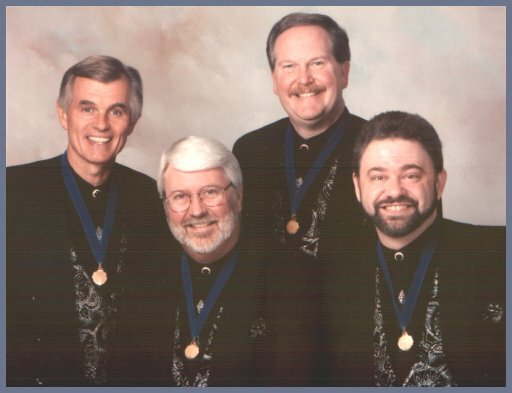 Since winning the Pioneer District Quartet Championship in l984, The Ritz has gone on to the International Quartet Competition of theSociety for the Preservation and Encouragement of Barber Shop Quartet Singing in America (SPEBSQSA). In July of 1991 they became the international champions while representing the Johnny Appleseed District. Since the barbershop society doesn't allow its international champions to re-enter competition, The Ritz has focused on making performance tours and studio recordings. The quartet has regularly performed throughout the United States and Canada and has been the featured entertainment aboard Caribbean and Hawaiian cruise ships. In the fall of 1994 they were featured on the nationally broadcasted PBS special, "Keep America Singing" and again in March of 1996 on the "World's Largest Concert." Their concert tours have taken them to Great Britain, New Zealand and Australia. Group members: Jim Sisler, Doug Nichol, DJ Hiner, Ben Ayling. The four men of The Ritz, 1991 SPEBSQSA International Quartet champs, are one of the classiest acts in the Barbershop world. "Puttin'" is like a "Best of The Ritz" cd: the title tune, "Moonlight Becomes You," "You Must Have Been A Beautiful Baby," "I'm a Train," "There Will Never Be Another You," "Happy Medley," "Where Is the One?," "No, No, Nora," "A Little On the Lonely Side," "Champ's Medley," "I Think It's Gonna Be A Great Day," "Misty," "In the Shade of the Old Apple Tree" and "Mammy Medley." The intricate harmonies, ringing chords, great songs--this is a feel-good, sing along, classy CD from one of Barbershop's best. Listen to "No, No, Nora" in Real Audio. 1991 International Gold Medalists the Ritz have released this CD commemorating their thirteen years together, and it is winsome and wonderful indeed. Containing such favorites as "On The Sunny Side of the Street" and "Camptown Races," the quartet also applies their melliflous tones to the bittersweet "Tell Me on A Sunday" and the heartwarming "Teach the Children to Sing," (including a chorus of children's voices). Several of the songs were arranged by Walter Latkzo and two by Ed Waesche. The group's adept performances convey their mastery of this challenging genre. Wonderful singing and a sense of humor abounds in the performance of The Ritz. These 1991 International Champions begin with a tune which sounds normal until you listen closely and your ear gets caught by a close harmony warble. Mixing award winning normalcy with tunes the likes of "Chopped Liver" (sung to the tune of "Moon River") will leave you eagerly awaiting, normal or ab? We have vocal horn breaks on the Old English "Landlord, Fill the Flowing Bowl," and a cover of the Smothers Brother's "Jenny Brown" mixed in among a wider variety of serious selections than one normally finds from such exalted medal winners. We don't know if its possible, but to our ears The Ritz sound even tighter on this recording. Perhaps it is the perfection of the ringing final chords which punctuate "Swingin' On A Star," "The Whiffenpoof Song," or the "Elmer Fudd Medley." Elmer Fudd? Yes, Elmer tackles his favorites. As you might guess, low humor is not lacking on this release but there is a sophistication (sort of) found on the song "Rigoletto Quartette." Once again they choose an Old English piece, this one by Thomas Morley, "Now Is The Month Of Maying" to extend the stylistic horizons beyond the formal barbershop competition songs, "Dixie Medley" and the like. It's a recording of Champions! 1991 SPEBSQSA champions The Ritz have produced 20 holiday confections for your aural consumption. From the expected "Silent Night" and "Jingle Bells," to Praetorius' "God Blessed Son Today Is Born" and the fifteenth-century "Myn Lyking" (featuring a string quartet) the arrangements aren't strictly barbershop. "God Rest Ye Merry Gentlemen," arranged by Greg Volk, adds countermelodic movement to its vertical seventh harmony, and when the Ritz swings into "I Just Want To Be Your Santa Claus" or "Santa Claus Is Coming To Town," which are exactly the Society arrangements we expect, it's jingle, jingle, all the way!